Midday: It was a very exciting day for me: I started my week-long unit on Tchaikovsky’s Nutcracker Suite. Watching the Nutcracker ballet and listening to Tchaikovsky’s festive music is a heart-warming way of getting ready for the holidays. I have a Nutcracker advent calendar for this purpose that consists of 24 miniature books that tell the story of the Nutcracker. Each day we’ll open five booklets and read the story they tell. I also have little wooden nutcracker figurines depicting Marie, the Nutcracker, Herr Drosselmeyer and the Mouse King. The children can take these figurines off the shelf and interact with them throughout the day. Today’s circle we started by lighting the sixth candle on our menorah and then I introduced the Nutcracker advent calendar and the main characters in the story via the wooden nutcracker figurines. Then I read the first five booklets from the calendar. It is Christmas Eve, the Stahlbaums are getting ready for the Christmas ball. Their children, Marie and Fritz are peeking through the keyhole to steal a glimpse of the beautiful Christmas tree being decorated and of all the presents under it. Soon, all the guests arrive and the party is on with dancing, games, and laughter. Suddenly, a mysterious guest arrives…After reading the story I showed the children a ten-minute excerpt from the New York City Ballet’s Nutcracker performance on our TV screen. It was lovely to see the children’s faces light up as they watched the ballet. Pm: I showed a Holiday Pop-up Card Making work that the children will be bringing home soon and then I showed the Holiday-themed version of our memory game with real objects. Midday: We lit the seventh candle on our menorah and then Natalee introduced the names of the shapes on our metal insets in Spanish. After that I continued our Nutcracker story. In the next five booklets of our Nutcracker story we found out that the mysterious guest who suddenly appeared at the Stahlbaum house was Marie’s uncle, Herr Drosselmeyer, the famous magician and clock-maker. He brought his nephew along and three giant boxes that had life-sized wind-up puppets that danced like real people. But the most special thing Herr Drosselmeyer showed was a wooden nutcracker soldier that could crack real nuts with his jaw. Herr Drosselmeyer gave the Nutcracker to Marie as a gift. However, Marie’s brother, Fritz snatched the Nutcracker from Marie’s hand and threw it to the ground. The poor Nutcracker’s jaw got broken. Following the story we watched the same episode of the New York City Ballet’s performance on our screen. The children were not happy with Fritz being so careless with the Nutcracker! Pm: As a warm- up exercise we did some practice with associating our letter sounds to the letters in our moveable alphabet set and then I showed a Holiday Stamping Book Making work. Morning: Music with Jan! Have you been hearing the children singing the Hanukkah, Christmas and other holiday-related songs Jan has been teaching the children? They will definitely add to the holiday spirits at your house! Midday: We went on with our story of the Nutcracker and found out that Herr Drosselmeyer bandaged the Nutcracker’s broken jaw with his handkerchief to make him feel better and his nephew gave Marie a tiny bed to lay him on. When all the guests went home Marie was so worried about her broken puppet that she snuck into the parlor in the middle of the night to stay with her Nutcracker and take care of her. However, at midnight some magic happened. The Christmas tree started to grow and shot up all the way to the ceiling. All the furniture and the toys in the room became Marie’s size. Suddenly, some mice appeared in the parlor following the lead of the Mouse King. At that moment the Nutcracker woke up from his bed and pulled his sword out to protect Marie. After a long battle the Nutcracker was just about to lose the battle but Marie took her slipper off and threw it towards the Mouse King to distract him. Finally, the Nutcracker defeated the Mouse King and cut the crown off of his head. After reading the story we watched the duel on our TV screen. The children were cheering when the Nutcracker defeated the Mouse King. When we came back from lunch we lit the eighth candle on our menorah and enjoyed watching all the candles alit during the afternoon work period. Pm: I showed a Nutcracker puppet making work. 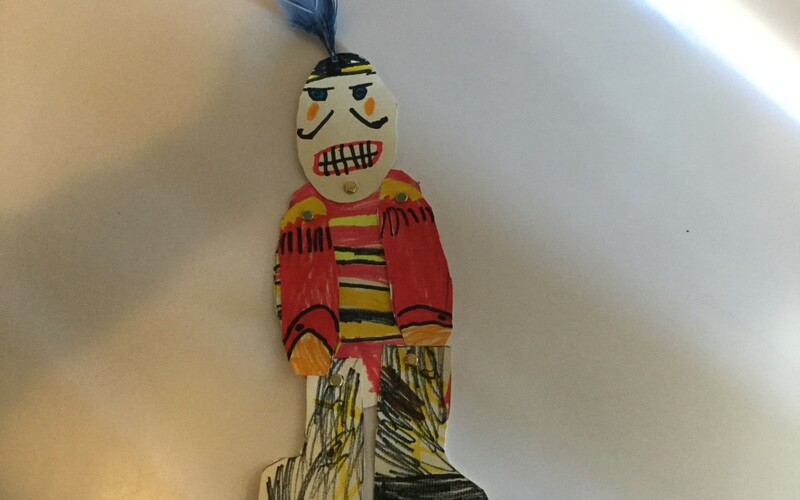 The children trace the body parts of their favorite character in the Nutcracker story, color it and decorate it with jewels, fabric and feathers and then attach the body parts to each other with Brads. As a result, they can dangle the arms and the legs of their characters as if they were dancing. The children were very excited about making their puppets; we even had to make a list of whose turn is next. Midday: After showing a Christmas number-quantity association work I carried on with our Nutcracker story. After the Nutcracker defeated the Mouse King he magically turned into a real prince and took Marie on a journey to the land of sweets. They got into a carriage made of a walnut shell and traveled through Lemonade Rivers and past buildings made of ice-cream, marzipan, candy and chocolate. Finally they landed in the court of the Sugar Plum Fairy who was delighted to hear the story about how the Nutcracker defeated the Mouse King with Marie’s help. I showed the children the dance of the snowflakes on our screen and the reception by the Sugar Plum Fairy. Pm: We went to our monthly library walk and listened to Erica reading us stories about trains. She even had a real whistle she blew from time to time! Thank you to all the parent chaperons who helped us on our walk! Midday: We reached the final scenes in our Nutcracker story. Marie and the young prince are nibbling on the treats offered by the Sugar Plum Fairy and watching the most amazing show the court dancers have put together. Arabian Coffee, Chinese Tea, Marzipan bonbons, and so many other brilliant performers entertain the young guests. At the end of the gala the Sugar Plum Fairy brings out a magnificent sleigh carriage for Marie and the prince to sail home across the sky. Marie is aware of the fact that her adventures were part of a dream, but in her heart she knows that somewhere the Sugar Plum Fairy and the Land of Sweets and the young prince might be real. After reading the mini books from our advent calendar I showed a short excerpt on the screen of the dance of Mother Ginger and her little bonbon children. Our children were wondering how all those bonbon children fit under Mother Ginger’s enormous skirt and whether they had their meals there too. Finally, I fast-forwarded to the finale where the beautiful sleigh-carriage is presented to Marie and the prince to set off for their journey back home. With this, our Nutcracker unit has come to an end, but the children will still have the chance to interact with the figurines and the mini books throughout next week. Pm: I showed a Gift Wrapping work where the children practice their gift-wrapping skills by wrapping up little boxes with holiday wrapping paper. I also showed a co-operative Christmas game where the objective is to help Santa pick up all the presents scattered all over the floor and load his sleigh before he gets to the end of the runway to take off into the sky. We spent this week under the spell of the magical story of the Nutcracker and learned that art comes in many forms and shapes. Just like words and pictures can tell stories, so can dance.